Warwick uses Teflon®, a waxy, opaque material from DuPont, to enhance the performance of many of our specialty fiber applications. 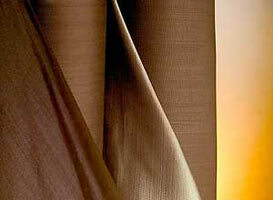 Teflon® has been woven into fabric that we have used for filtration applications. Unlike some other fluoropolymers, in Teflon® this chain is completely surrounded by fluorine atoms. The bond between carbon and fluorine is very strong, and the fluorine atoms shield the vulnerable carbon chain. This unusual structure gives Teflon® its unique properties. In addition to its extreme slipperiness, it is inert to almost every known chemical.